When someone finds a Roman coin in a field, they often imagine that they have stumbled across something of great value. It is after all old, rare and made of a precious metal. The reality is that only the first of those things is true. Roman coins can be bought on Ebay for a pound or less. And the disappointment with the low value of the coin is something that the original owner probably shared. I am not sure how I acquired it, but I have just been looking at a paper from the learned journal Ecological Complexity. It is by Joseph Tainter. I’m afraid I don’t know anything about him except that he has written this very interesting paper. I did a bit of googling and learned that he has written books and papers on ecological issues. He is currently at Arizona University. The paper is called Social Complexity and Sustainability and it’s premise is that societies become more complex when they acquire more energy. So for instance Great Britain became more complex as a result of the improved harnessing of power during the industrial revolution. But that this complexity makes the society less adaptable and less able to cope with shocks. All interesting stuff, especially for those of us with highly specialised jobs that are only sustainable in an energy dependent highly complex society like the one we live in at the moment. Its a very interesting paper but I only have time to pull out one thread from it at the moment. He uses the Roman Empire as an example of a complex society. During the time that the empire expanded the Romans were able to pull in new resources that enabled them to become more complex and sophisticated. When the empire stopped expanding the issue became sustainability. This could only be done by increasing central revenues via taxes for distribution to the civil service and much more importantly the army. Well there was one other way. As the empire was a money based economy there was also the option of debasing the coinage. The medium of exchange was silver, and the denarius was supposed to be an official designation of a prescribed amount of silver. But of course, if you replace a bit of silver with a cheaper metal, nobody will notice and you get more denari for your bullion. In the long run of course it doesn’t create any more resources, it just diverts the resources away from the individual citizen and towards the central government. In this respect it is very much like taxation. But it has the advantage that the citizen doesn’t notice in the short run. In the long run it puts prices up – but who cares about the long run when you have legions of highly armed men trained to kill who are expecting to get paid on your hands. 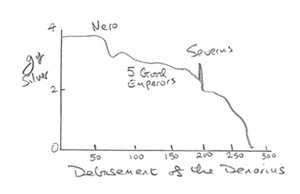 Interestingly Professor Tainter (I am assuming he is a professor) produces a graph showing the silver content of the denarius over the first two and half centuries of the empire. I don’t want to infringe his copyright so I will do a sketch of his graph. The decline starts at about 60AD and is fairly steady from then on. But the rate of debasement increases from 160 until around 235 when it plummets ending up at zero in 269. What does this tell us? Well, basically they were all at it from Nero onwards. Once the process had started the logic compelled it the direction of further debasement. After all, you would need a lot of silver to increase the content of coins. And you would have to withdraw the coins already in circulation. There is one upward spike around 200. Maybe Severus was able to extract a lot of metal from the Parthians when he sacked their capital in 197. But basically each successive emperor bequeathed his successor a currency that was worth less than the one before, even though there were many more coins in circulation. It is little wonder that you can find Roman coins in fields in southern England so easily. The original owners probably couldn’t be bothered to pick them up if they dropped them. By the end of the third century the official coins were worthless and the government would not accept them itself as payment for taxes. It is also pretty obvious that people behind the debasement knew very well what they were up to. Until the very end, the debasement was small and stealthy and probably did relatively little actual economic harm in the short run. It isn’t difficult to get used to small levels of inflation. It may well not have been the palace itself that was the primary motor of the process. There is a story that the emperor Aurelian tried to reform the currency, and the coiners reacted so violently against his proposals that the emperor had to send the army in with a reported 7,000 casualties. It is entirely possible that some or even most of the gains were funelled into private hands. Cash bought power in the Roman world, much like it does today. The debasers may well have been an influential lobby. So are there any lessons for us today? Economically speaking debasing the quantity of silver in the coinage is exactly the same process as printing money, or to use its current euphemism quantitative easing. You can get away with it for a long time. The Caesars managed it for centuries. But the benefits were pretty thin, and not particularly fair. The senatorial class, whose wealth was primarily in the form of inflation proof estates did very well. The mass of poorer citizens were paid wages in money that continually declined in value. This made it impossible for them to save. Governments around the world, especially in the US and UK, are cheerfully churning money out at the moment. Will the effect be the same as in Ancient Rome? I personally think not. Sophisticated as they were, the Romans didn’t have the level of complexity to have what we call a financial sector. There was plenty of trading going on and lending and borrowing was widespread. But they didn’t have banks that were able expand the supply of credit. The closest they had was silver mines. So the only people able to increase the supply of money into the system were the government owned mints. I have a feeling that all the quantitative easing at the moment is simply replacing some of the inflationary effects that banks were having by increasing the effective amount of money around through various clever bits of financial engineering. Most of these were simply ways of hiding up the fact that the banks were lending with no collateral. But there is a clear danger of things getting out of hand like they did in the third century. If nothing else, it shows that once you start this kind of thing, it is difficult to stop. Now, what has changed between now and then? That's a good question, and hopefully we can discuss it more. Thanks for your comment Scepticus, and welcome to my home. I feel like I have just invited someone in after only chatting to them in the pub for a couple of years. I have read your posts, and if I understand them correctly I think I agree with them. And I can't see any particular contradiction between what I have written and what you are saying. Where do you think I am wrong? you are saying tha QE is producing funds to be gathered to the central government and cronies. This is not correct, and it is certainly not like the roman debasement you outline. In QE, the CB buys a bond and gives the bondholder the entire face value to do with as he pleases. So no funds are retained centrally. In fact the bondholder retains a claim on the CB via the bank deposit he gets as a result of being paid for the bond. In coin clipping, the clipper only gives the bondholder part of his payment and keeps the rest. b) in QE the inflationary effect is instantaneous more or less, but with the coin clipping the effect is to REMOVE coinage from immediate circulation and thus INCREASE the value of the coin retained by the clipper. c) if the coin holder had a debt of one coin, he cannot now pay it because he has less than a coin. however in the QE case the bondholder can fully repay any nominal debt he may have had. Oh I see what you mean. Yes quite right, but I didn't mean to suggest that it was a perfect analogy.